Here’s our monthly update. We have a lot to cover. Let’s start with this new track from our composer, Kevin Won. That will be the theme for Sunrise Falls, the town where our story starts. It has been a while since we added a new song from Kevin, as he has been working on other projects. But he is back with the Rockwell Studios team now and he will be providing much more music in the future. 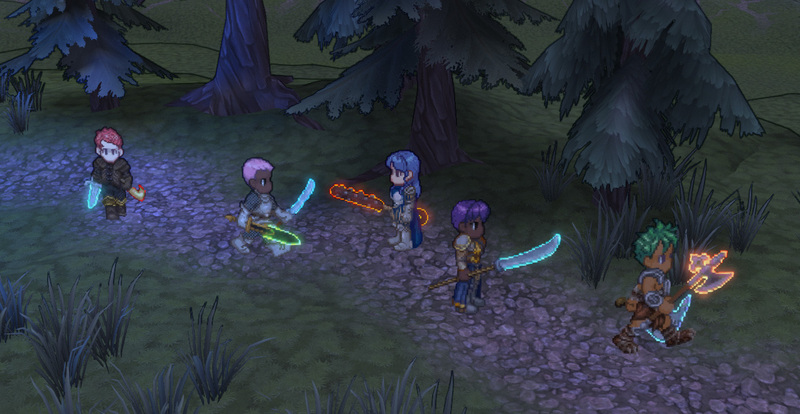 Next let’s take a look at those glowing weapons. 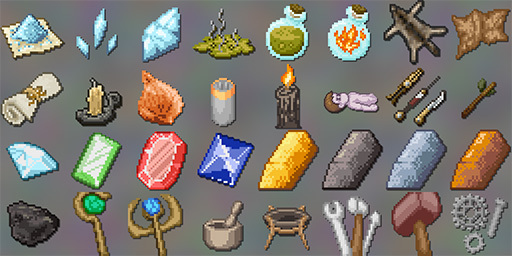 We wanted to introduce magical weapons and give them some sort of visual indicator that they aren’t just regular weapons. The weapons already had a texture for RGB and opacity. Adding a glow mask should have required adding another texture, which I didn’t want to do. So instead I messed with how the material interprets the alpha channel, which now serves double duty as both the opacity mask and the emissive mask. The glow itself is very simple: a tiling cloud texture at different scales, one panning up-left and the other panning up-right, multiplied together, used as the alpha for a lerp between two colors. 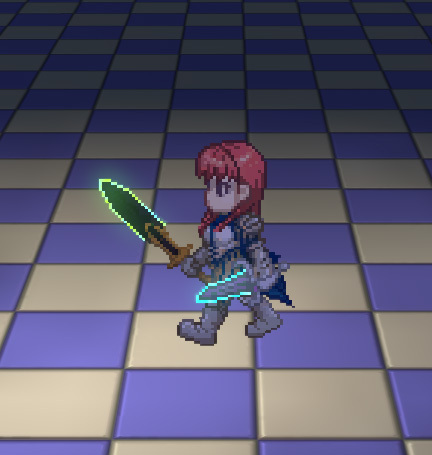 Reassembling the sprite material (which is basically a lot of textures layered in different orders depending on camera direction and pawn direction) in order to layer the glow mask properly ended up being a large undertaking. But I think the effect turned out nicely. 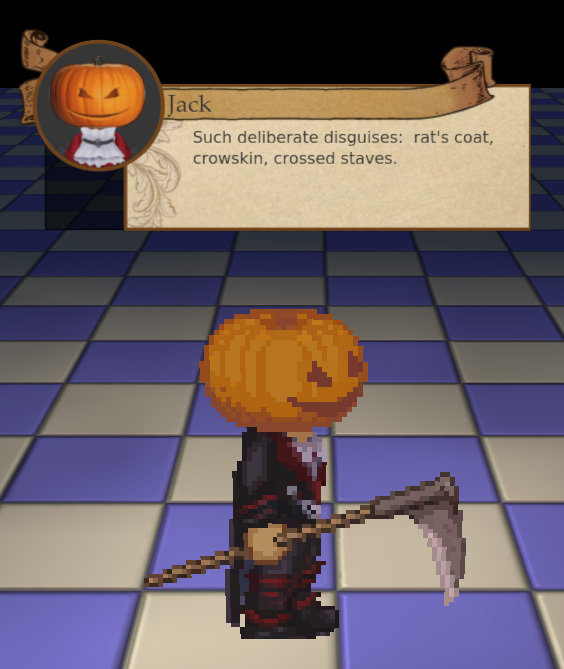 Next, we added a new character type to the game. A multi-world-spanning epic RPG just seems to need more characters, so we added one more this month. 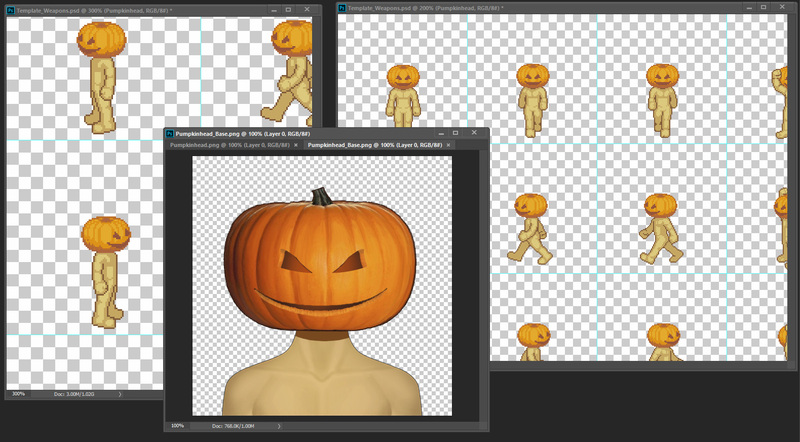 This is the pumpkinhead, shown in-game, in a test level, and on the drawing board. These guys introduce two new character classes–the Strawman and the Scarecrow–and they are the first characters to use the new scythe and sickle weapons. All of their speech consists of lines from the Hollow Men by T. S. Eliot. The poem itself is a little unsettling. Having a scarecrow recite relevant lines from it during combat is even more unsettling. We also made some graphical improvements with procedural fire and dynamic lighting. 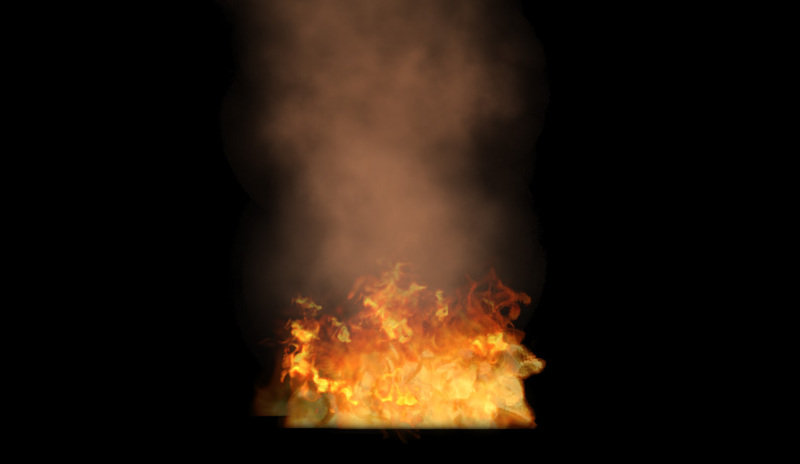 Himeko Sutori’s fire used to consist of flipbooks from a purchased asset pack. We’re replacing most or all instances of those fires with procedural fire, which we think looks a lot better. I made a jagged shape with a yellow-orange-red color ramp in After Effects. I multiply that by a panning yellow-black-red noise pattern. And then I pan a different noise pattern and add it to the texture coordinates, and I get a beautiful shimmering, flickering, dancing fire. We had been avoiding dynamic lights for a long time due to performance concerns, but eventually we reached a point where we just could not achieve the desired look without them. I tried out some dynamic lights and realized that in our target hardware requirements, a couple of dynamic lights here and there won’t hurt performance. We’ve realized that we really prefer the aesthetics of a fixed camera position. Whether fixed to world space, or fixed relative to the pawn, we just like the way it looks and we like the simplified level design. 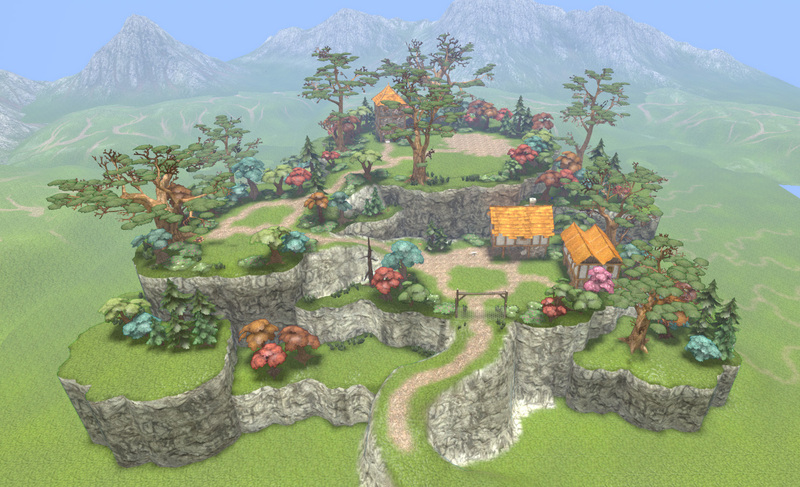 So in large open areas like the world map, the player will have some camera movement. And during combat you’ll need camera movement. But just about anywhere else, we’re going to keep a fixed camera. The fixed camera works really well in places like this new town we added. This new town serves several purposes. It let us try out a new camera mode. 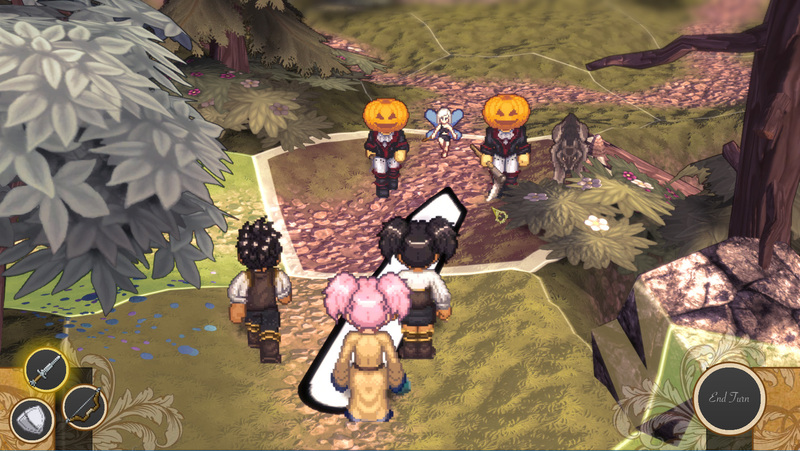 It also changes the pacing of the first chapter and gives us a place to introduce crafting stations.